Red maple trees (Acer rubrum) are also known as scarlet maple, swamp maple, soft maple, Carolina red maple, Drummond red maple and water maple. The red maple has a short to medium life span– no longer than 150 years–in relation to other trees, but the beauty they bring to the landscape, even if the tree will not be around for generations to come, makes them a worthy investment. Red maple trees are deciduous– leaf-shedding– broadleaf trees that grow to a height and spread of from 40 to 60 ft. They produce leaves that are green on the top and gray on the bottom, and that turn yellow or red in the fall. The red maple is one of the first trees to flower in the spring, producing small red or yellow flowers from March to May, depending on the location. The trees start producing seeds when they are about four years old. Red maple trees are hardy in zones 3 to 10, i.e., all of the planting zones in the continuous United States and into the parts of Canada where the coldest winter temperatures do not go below -40F. Red maple trees can grow in partial shad (three to six hours of direct sunshine a day) or in full sun (six hours or more of direct sunshine). They are very adaptable when it comes to soil, growing well in sandy, loam or clay soils that can be wet, moist or dry, and they can survive a flood situation. The natural habitat of the red maple ranges from southern Canada to east Florida and as far west as Minnesota, Wisconsin, Illinois, Missouri, eastern Oklahoma and eastern Texas. 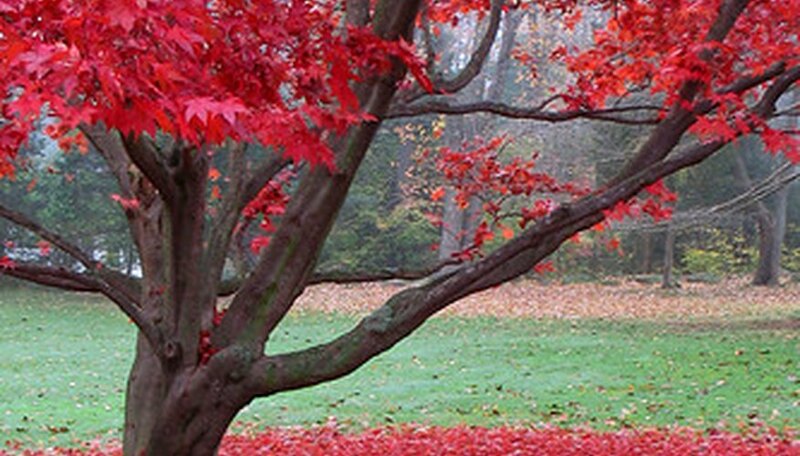 Red maples can be used almost anywhere as a street tree, a backyard shade tree or a front lawn specimen tree. The wood is not as hard as that of other maple trees, but the best is used to make furniture. The sap can be used to make maple syrup, although the season is shorter than it is for the main syrup producer, the sugar maple. Red maples are susceptible to several fungal diseases and, unfortunately, fungicides do not work well on these trees. The trees can suffer from root and stem rot, cankers, fruit rot and rot in the heart of the tree. They are also susceptible to several leaf diseases, but for the most part these only do cosmetic damage. Insects can also attack the red maple. While they will not destroy the tree, they will weaken it and make it more susceptible to fungal diseases. Insects to watch out for are the maple borer, the maple callus borer, the Columbian timber beetle, the cottony maple scale, the maple leaf scale, the oystershell scale, the gypsy moth , the linden looper, the elm spanworm and the red maple spanworm.